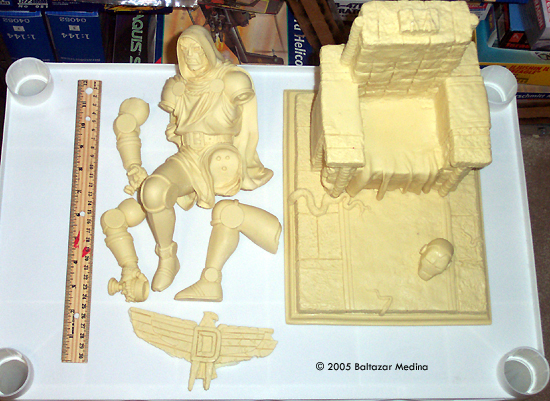 Molding Quality: 8 will require light and in some places careful sanding to remove the mould lines. Overall Rating: 9 This is one of the best resin figure kits I have seen. A lot of resin for your money. This is a must have for any Fantastic Four fan. The first thing that will stand out from the kit will be the weight of it when you try to pick it up. Once you open the box you will see that all the parts are well wrapped. The large parts are wrapped in bubble packaging and newspaper with the smaller parts in sealed sandwich bags. The figure is very well cast but there are some spots that I have noticed that will need to be filled on my kit, the right foot and the chin. The throne is also very good with great details all around it. 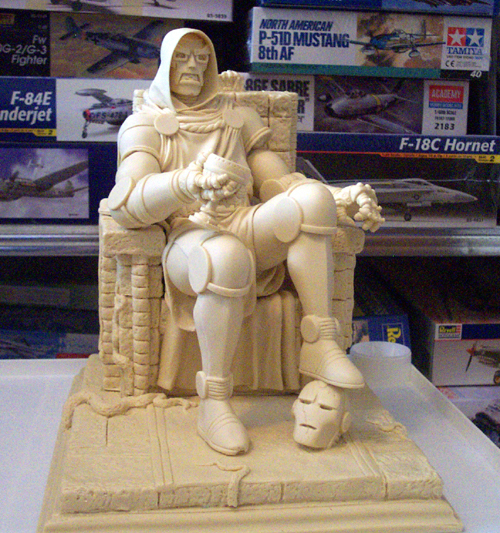 The base is cast just as good as the other parts and the fact that is has Iron Man's helmet so Dr. Doom can rest his foot on makes it very cool! The kit comes with 5 pages of instructions but they are more focused on painting the kit and include in-progress color pictures of the finish as well as all the supplies used by the builder. Even though the instructions do not explain the assembly of the kit it looks very easy and should pose no problem. I'm not into figures but when I saw this kit in Modeler's Resource #56 which also has a very good build up on it, I knew I just had to have it. Overall this is a very good kit, simple assembly, awesome painting instructions and a great subject. 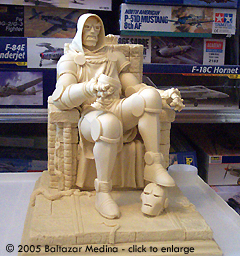 All I would like now is a similar one of Red Skull. Many thanks to Balta's wallet for providing the review samples. Manufacturers and retailers, interested in getting your wares reviewed and publicized on a site averaging 3500+ readers a day? Contact us! This page copyright © 2005 Starship Modeler. First posted on 7 April 2005.